You are here: Home » Mmmmm…cookies. Tonight I made a new ‘classic’ (in my opinion) – it’s a Martha recipe for Chocolate Chunk Cookies from her Baking Handbook. They turned out as described, thin and buttery. And melting with chocolately goodness. I made these a few weeks ago and a few minutes after I put the last tray in the oven – the power went out! Not to fear! A few extra cooking minutes (actually…about 40) in the still-hot oven baked them to perfection. Therefore, these cookies I have nicknamed, “Blackout Cookies”. Blackout from the sugar, really. The recipe asked for 2 sticks/1 cup of butter – which is a lot. I’m usually very hesitant about putting so much fat into cookies, but they taste absolutely amazing. I upped the chocolate amount (don’t I always??) to 15oz (instead of 12oz) and did half Chipits semi-sweet chips and half Trader Joe’s Dark Chocolate chopped up. 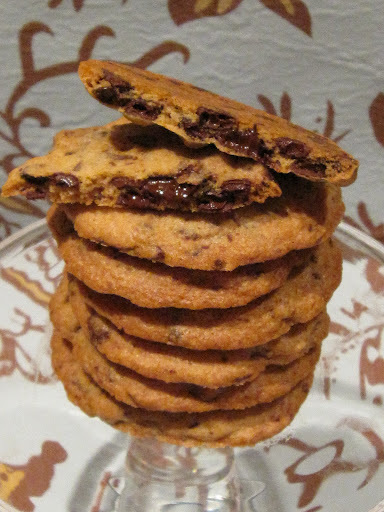 They look extra chocolate-y as the dark chocolate, chopped up, speckles the cookies in a really unique way. The distribution of the chocolate while they baked was interesting as well, there were a bunch of cookies that looked quite bare up top, but were generously ladden with chocolate at the bottom. Yum. I need to figure out how to put borders on the pictures. I’ll probably have to fiddle with the good ol’ CSS again. Gah! I’m glad my COMP1850 course came in handy! By the way. I had a dandy of a time trying to get a decent picture of these cookies. I do not know how people do it. I need to get some proper lighting to do a good job.